From left, ONCV's Phil Funga and Mike Kilroe with Office Brands CEO Gavin Ward. Office National Canning Vale and Stuart and Dunn Office Supplies have shared top honours in the 2016 Stationery News Reseller of the Year Awards. Perth-based ONCV won the metropolitran award, having successfully weathered challenging economic conditions in Western Australia by developing and expanding a joint-venture office products distribution service. Newcastle-based Office Choice dealer Stuart and Dunn won the regional award following one of its most successful years ever with a string of initiatives which resulted in a 16 per cent increase in turnover. Respective runners-up in the metro and regional categories were Adelaide Direct Stationers and Blue Mountains Office Choice. 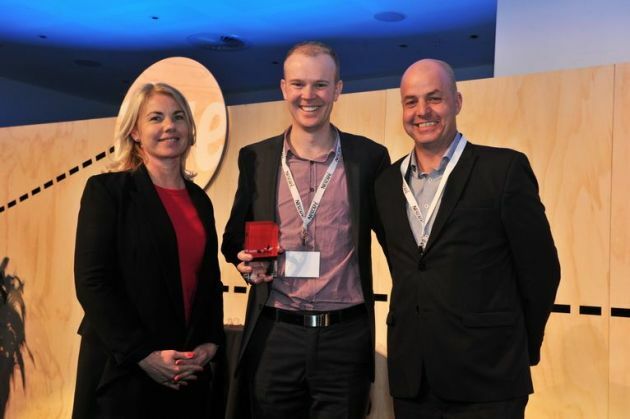 Canberra-based ASA member Blue Ink Group won the inaugaural Innovation Award for its establishment of a rapidly-expanding education division. This year's Community Service Award was presented to Stuart and Dunn in recognition of the company's contribution to several charities and community groups, particularly BeyondBlue. Former long-standing Office Choice director and owner of City Stationery Office Choice, Hilary Lee, was inducted into the Stationery News Office Products Hall of Fame. Stuart and Dunn's Daniel Kelly flanked by Stationery News publisher Lindy Hughson and Office Choice CEO Brad O'Brien.